Happy Saturday! It's a beautiful bright and sunny day here today. 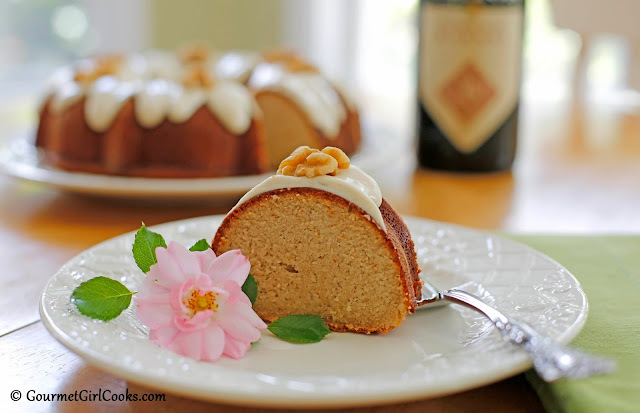 Today, I am very excited to be sharing and posting this new cake recipe because it is a VERY special one. It was a "special request" that I received. A few weeks ago, I received the sweetest email from the husband of one of my follower's...yes, her husband! He told me his wife has been a regular follower of my blog and that she had a very momentous birthday coming up next month. Evidently her absolute favorite cake that he makes her each year is a "Sherry Nutmeg Cake", but is no longer allowed on her wheat free, sugar free diet. 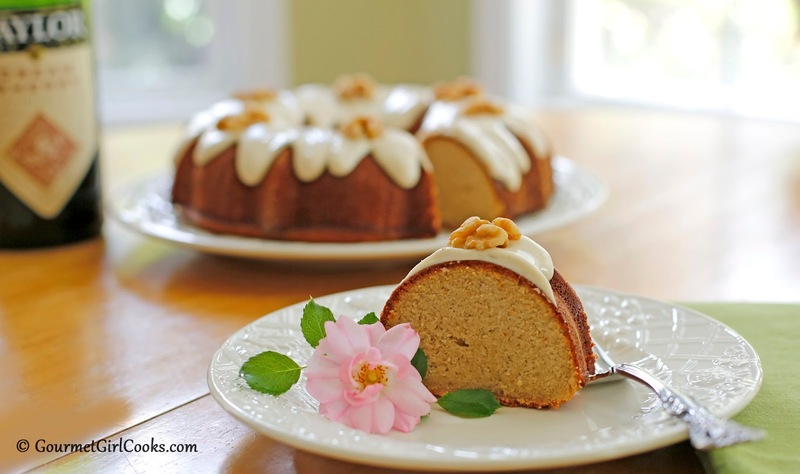 He asked me if I could help him make an almond flour based version of this favorite cake and he sent me the original recipe to see what I could do. The original recipe included a yellow cake mix and a packaged pudding mix, so I had some tweaking to do for sure. 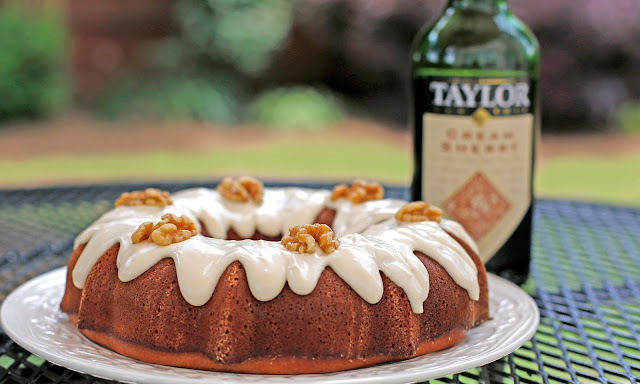 It also uses cream sherry (wine) which is a sweeter sherry than dry sherry. Now, before all the low carb police show up with their comments, I calculated it and the addition of the cream sherry only adds about 2 additional carbs per serving and slightly over 1 gram of sugar per serving. He felt (and I concur) that for a birthday, particularly a momentous birthday that she is about to celebrate, it is perfectly fine to make that little splurge, especially because we are still keeping it wheat, grain, gluten and sugar free. It's actually more than fine. I am so genuinely touched and proud that this lucky woman's husband actually made the effort to contact me and try to accommodate her wheat and sugar free diet so she could still enjoy her favorite cake on this very special birthday. The total carb counts per serving (12 servings for a 10-inch Bundt cake) come to approximately 6 net carbs and 1.5 grams of sugar per slice. Since I never tasted the original version of this cake, or any cake with wine before, I can't speak as to how it compares taste wise. I can, however, say that this cake was absolutely delicious! It was moist and the sherry flavor was not overpowering but more subtle and very pleasant. I reduced the 2 teaspoons of nutmeg called for in the original recipe because I feared it might be overpowering and wasn't sure it was correct, so instead I added 1/2 teaspoon nutmeg and 1/2 teaspoon of cinnamon. If the original recipe's 2 teaspoons were not too much for the requester, then most definitely keep that amount when you make it for her birthday. Oh, and by the way...the vanilla glaze I added on top is amazing!!! 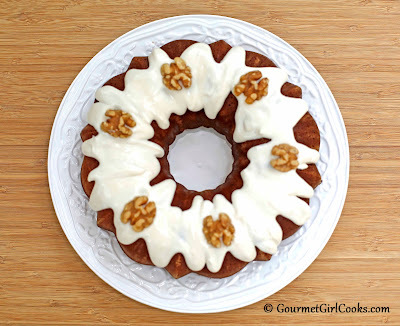 I hope you enjoy this modified version of "Sherry Bundt Cake." Happy Birthday lucky lady, wherever you are! Enjoy! Preheat oven to 325 degrees F. Grease a 10-inch Bundt pan generously with coconut oil and dust with almond flour; set aside. In a large bowl, combine and whisk first 8 dry ingredients together. In a separate medium bowl, beat eggs, oil, vanilla, vinegar, and cream sherry until combined. Add liquid mixture to dry ingredients and mix well. Beat with a hand mixer for 2 to 3 minutes until well blended, light and smooth. Pour batter into well greased AND floured Bundt pan. This recipe makes approximately 5 cups of cake batter. 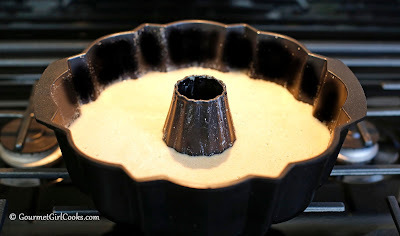 Bake for approximately 50 minutes or until a toothpick inserted in the cake comes out clean (begin to check cake for doneness after about 40 minutes). Cool in pan for 10 minutes. Invert onto wire rack; cool completely. If desired, lightly dust with confectioners sweetener or glaze with optional vanilla glaze. *For Optional vanilla glaze: Combine cream cheese, cream and vanilla; add confectioners sweetener 1 tablespoon at a time, mixing vigorously until desired consistency. To slightly tweak and add sweetness without altering the glaze consistency, add a drop or two liquid stevia. 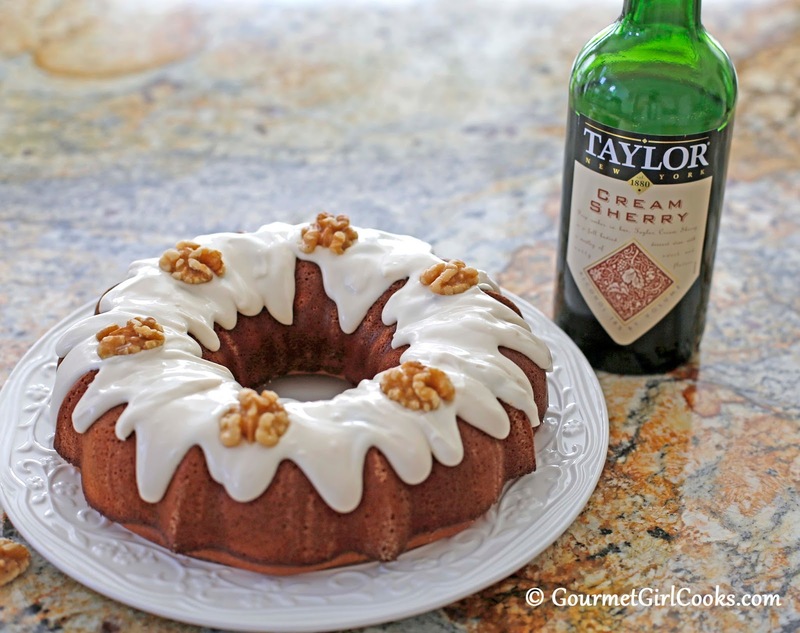 If using this glaze, store glazed cake and any leftover glaze in the refrigerator. 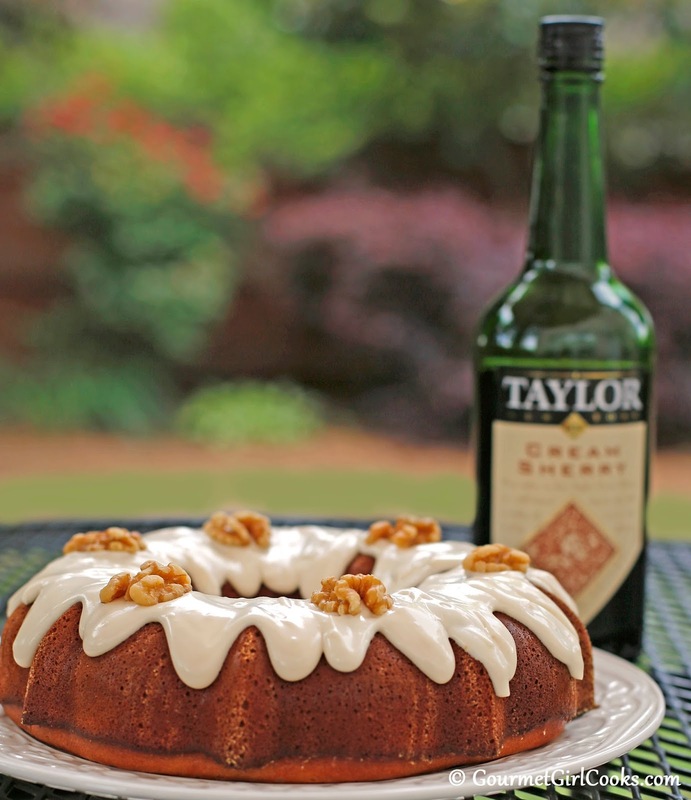 *Notes: Cream sherry is a sweeter type sherry wine (not dry sherry and not cooking sherry). If you prefer not to use wine with alcohol, you can substitute with water or milk (which will produce a basic yellow cake that can be flavored with a variety of extracts if desired; such as almond, orange, lemon, etc.) and simply omit the cinnamon and nutmeg. 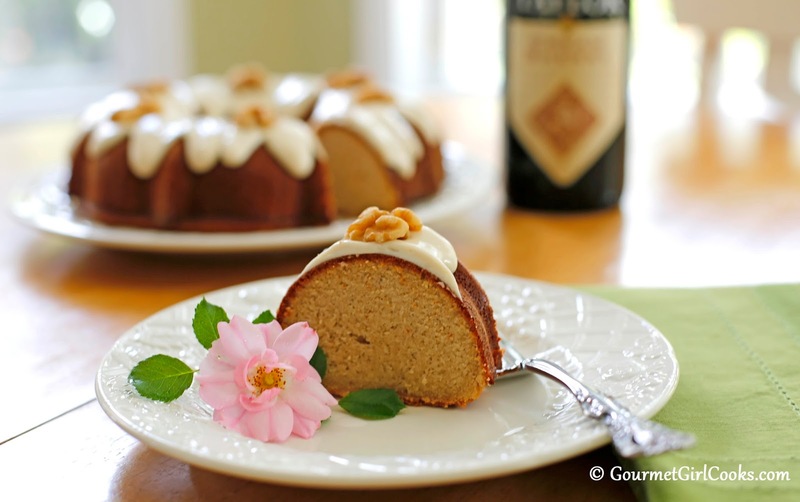 This recipe can be used to bake two 8-inch round cake layers or a square or rectangular cake. If making 2 separate layers, the cooking time would need to be reduced, so begin checking baking times after about 20 minutes. To soften the cream cheese for the glaze, I simply heated the 1-1/2 tablespoons cream cheese for about 15 seconds in the microwave before blending in the heavy cream, vanilla and sweetener. Hi! Looks like you are missing the units on the cream sherry ingredient in the recipe. Raising hand - I recognize that recipe - and my hubby's resourcefulness! I'm so excited - my Birthday-With-A-Zero is this week and he's very good at following recipes, so I'm looking forward to this! I think your remake sounds fabulous. I dug out the original version, and yes, it calls for 2 teaspoons of nutmeg, but the nutmeg/cinnamon combo sounds great too. Your pictures were gorgeous, as usual! The glaze is the perfect topping. Thank you so much for doing this - I'll be sure to report back after he makes it! Ayla this is fantastic! Looks like a regular cake with a beautiful *rise*. I will use this recipe as a template for my famous *Apricot Brandy pound cake*. I am very sensitive to Alcool ( one drink and I am high)) I am a real cheap date, lol ., so I prefer to use it in cooking and baking., the alcohol will be gone. I have not posted much but I never miss a single recipe. I have trouble now typing, only have two *good * fingers (joints) left .So it takes me a while to write. That grain free diet (2 1/2 ) years now, has made no difference ! Au contraire my health is much worse. I never cheated, not even at Christmas . Thank God for all the helpful gadgets, blenders , choppers and food processors. I use my elbows to push buttons . A friend thought that my kitchen would look better without *my helpers* on the counter! Putting them away is just too difficult. Sorry, I am venting here ! I just wanted to explain my rare posts . Have a wonderful weekend Ayla. This is so funny...I was thinking about you today and wondering how you were doing and whether or not you still looked at my blog. I even thought about adding a little message to you in one of my posts to see if you were still out there. While I am so happy to hear from you, I am so sorry to hear that your joints have gotten worse, especially after being grain free for so long. I agree with you, if you are using your gadgets, it is much easier if they are handy and being practical and saving yourself the effort of taking them in and out makes more sense than having an empty counter. Finally I know someone else that can't tolerate drinking alcohol too. I have never been able to. I can't even have one drink...after half of a glass of wine, I can no longer feel my nose...LOL and I become ridiculously silly...so I rarely drink. 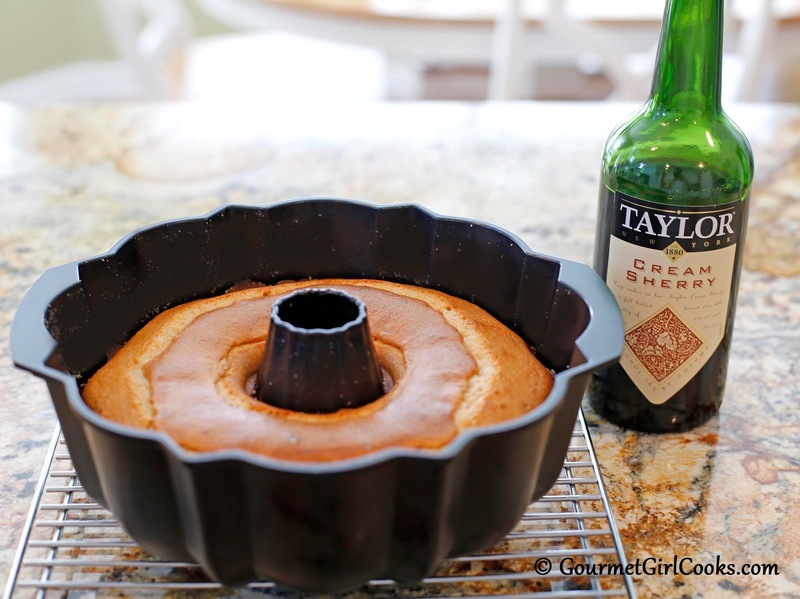 Oh my, I bet this would be a great base cake for your apricot brandy pound cake! That sounds delicious. My original post looked different but I was afraid to post it . But here it goes. I think that you are such a good , generous and giving person . I just feel it. Wish I could run into you at Costco aand give you a big hug. lol. I hope that your health and that of your child will stay good, that is really the most important thing. I hope whatever your child has is curable ! Unfortunately my youngest daughter has been diagnosed with RA too. Worries are never ending! GGC You are not only extremely talented but you are very kind hearted. 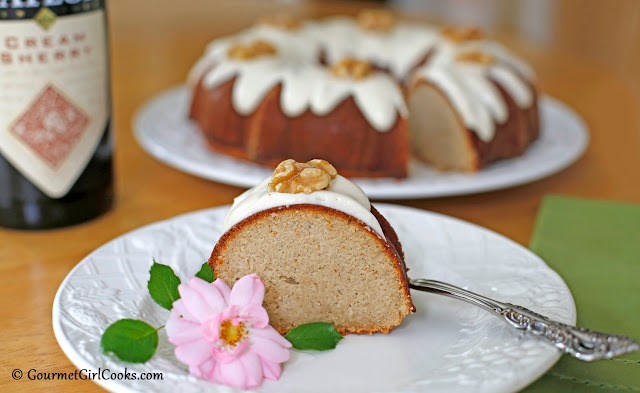 Anyone who would take precious time out of their day to convert a home made cake recipe to one that would adhere to one's diet is just nothing short of remarkable. The cake you made looks so beautiful and I am sure you made not only one gentleman extremely happy, but also his lovely wife who is celebrating a special birthday. Best wishes to all and I know the cake will be devoured. Here's hoping the bottle of Cream Sherry will also be enjoyed. Thanks. I believe I simply used water on my "yellow pound cake recipe"...but I'm thinking you could also make a sweet home made lemonade with fresh lemons in place of the sherry; also, I'd probably start off with 1 teaspoon lemon extract and taste the batter for flavor...too much is sometimes worse than not enough. You could also add some fresh zest as well. I do hope this cake turns out well for StoneFX...everyone here really loves it, but then we aren't comparing it to on old favorite recipe either. What a great idea using lemonade in place of the sherry ... love that, and the fresh lemon zest, too. I agree that too much lemon extract is worse than not enough. (LOL, ask me how I know!) I'll be sure to add it with a light touch and taste as I go along. Thanks for the helpful hints! Peace to you and to your loved ones. Looks like my report got lost in space, so I'll try again. The cake turned out absolutely delicious - very close to the original recipe. Maybe a tad drier - and at first it seemed that the sherry flavor was a little more pronounced, maybe because there wasn't all that sugar & flour & artificial stuff from the cake mix & pudding to counterbalance it. However, after having a leftover slice tonight, I don't think it was too much sherry. My hubby went with the 2 tsp. of nutmeg from the original recipe and that was just fine - not overpowering. He's a big fan of buttercream icing, so he doubled the recipe for the glaze and must have added a little more Swerve because it thickened up (he used the Kitchenaid stand mixer and maybe the heavy cream was turning into whipped cream too!) and he was able to frost the whole cake with it. Yummy! Thank you again for taking the time to rework the recipe. I'm glad to read that others have ideas for variations. I think it could be a very versatile recipe and is one that I'm sure I'll use in the future. And yes, my husband is a keeper - even cleaned up the kitchen afterwards! Thank you for letting me know that your cake turned out so nicely. I am so happy you enjoyed it and still touched that your husband took the time to do that for you. I, too, thought the sherry flavor was strongest the first day I tried it and then not as much after. 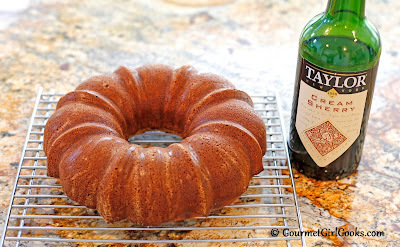 In an email to your husband I told him that the cake was more "pound cake" textured and that if the original recipe was a more moist cake like so many bundt cakes are, that he could add an extra couple tablespoons of oil. If he didn't try that, maybe next time he could to see if that makes it a little closer to the original recipe, because it had more oil in it. Oh my, if he is using the Kitchenaid mixer, not only am I impressed, but you are right, it did probably thicken the cream up by whipping it since I just used a whisk. Even though I have a Kitchenaid stand mixer, I don't pull it out and use it as often as I probably should. Just wanted to let you know that I made a lemon version of this cake for my Mom's birthday, and it was wonderful! I used plain water for the sherry. I omitted the vanilla and spices and added 2 tsp. lemon extract and zest of 2 lemons. For the glaze I omitted the vanilla and added 1/2 tsp. lemon extract and zest of 1 lemon. I didn't need to add the optional stevia. So happy it turned out nicely with your lemon modifications. Great idea to do the water and lemon zest combo (instead of lemonade like I had suggested)...you removed a step there that wasn't necessary! LOL So happy it turned out nicely and hope your Mom enjoyed her birthday.